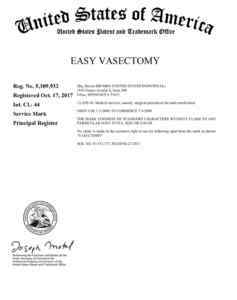 Office proceduralist in Minnesota, Dr. Steven Shu, obtains a registered trademark from the United States PTO, for his Easy VasectomyⓇ, a minimal invasive office procedure with no scalpel, no needle and no stitches techniques. The introduction of Easy VasectomyⓇ has successfully allayed many men’s fears with regard to the scalpel and needle. It is safer, less invasive, and has fewer complications and quick recovery. Under local anesthesia, only a tiny puncture is made at the midline of the scrotum skin. It can be done in less than 10 minutes. One Stop Medical Center developed a powerful website, EZvasectomy.com, with rich information on vasectomy and vasectomy reversal. All patients are required to review the important vasectomy information and watch a consultation video. A separate initial consultation is no longer required, and Dr. Shu will finalize the consultation on the same day of the surgery, so the patients don’t need another trip for the initial consultation. Moreover, the patients are able to register their vasectomy procedures by filling out the online registration form in the website. One Stop Medical Center developed a mailer system to eliminate another trip for patients. Patients who live far away may simply mail the specimen to the clinic instead of bringing it personally. Therefore, most patients are able to have a vasectomy done in just one trip to our clinic instead of three. In order to reduce the financial burden for our vasectomy patients, the price of no scalpel vasectomy was cut in half. This way, more men can afford to have their vasectomy done.